April 28th- Purse Bingo. More details to follow. The Towson Junior Chamber has been serving the greater Towson community since 1953. We help build a strong future for our members through leadership training, networking, and community involvement. 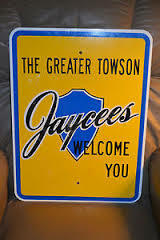 Junior Chamber members, “Jaycees”, work with the business community, other civic organizations, and the government to improve the quality of life in the Towson area. Membership in the Towson Junior Chamber provides Baltimore County with the leaders necessary to ensure its continued vitality and growth.